Silver Satin sash with white satin insert. Numerous options available. Choice of letter colors and texture. Custom Logo or clip art - if selected, your full color logo or art work will be placed before the text. Any other clip art selected will be placed at the end of the text. 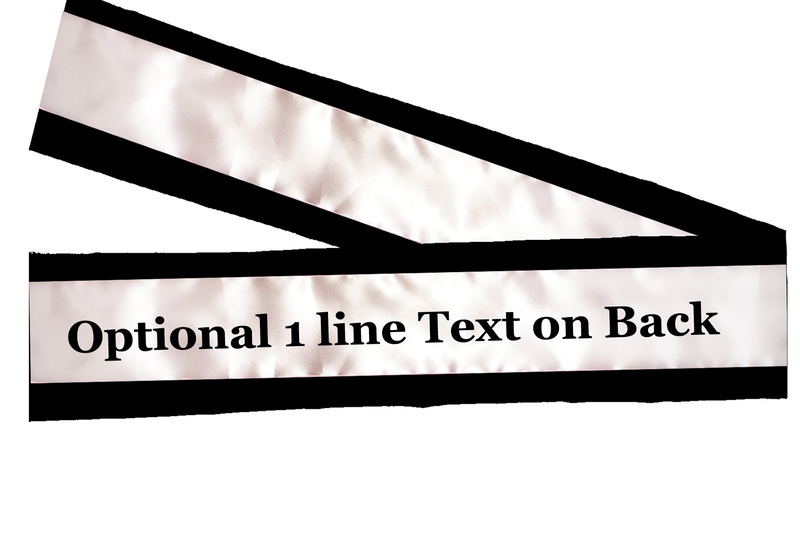 Optional back text - one line of text available in same color and texture as front text. Digital Proof If selected, we will email you a digital proof of your sash within 24 hours of ordering. Proof must be approved before production begins. Changes can be made if available before production. Please allow 5 working days (excluding weekends) for production plus shipping transit time. Letters are applied with a commercial heat press. With normal wear, letters will not flake off. Click the button below to add the Silver Satin sash with white satin insert. Numerous options available. to your wish list.